YES Professionals are the Best in the Utah Staffing Industry! The holiday season is the perfect time to show gratitude for those people in your life that make it easier and more enjoyable. One of those people for YES is Eithan Smalley! Eithan is fairly new to the crew in our Ogden office, but he has been such an amazing addition to the team. He has been very eager to learn, learns quickly, always wants to know more, and is always helpful to those who surround him from his manager and coworkers to all guests that walk through the door. 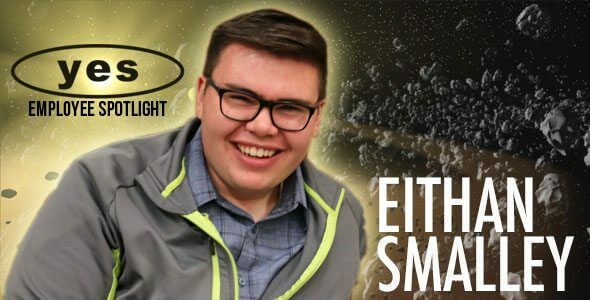 Eithan has such a fun personality that compliments his team well and keeps the atmosphere fun and lively. Pizza, Paychecks, New episodes of the walking dead, books, and learning. I like the opportunities it provides for me to grow. 7. Your favorite motivational book. And why? Mindset by Carol Dewick. I love this book because it gave me a new positive outlook on life! It would have to be working so hard for someone only to have them let me down. I think that knowing before going into any situation that no one is perfect including yourself. 11. One of your long-term goals is to mine the asteroid belts for minerals and ore. That reminds me of that Armageddon movie where Bruce Willis saves the world from an asteroid. Who would be more likely to save the world from an asteroid? Reed Laws the president of YES, or Kerry Westenskow the vice president? Kerry, He’s taller. I think he would be able to catch it first. Thank you for the value you add to YES, Eithan! You deserve every bit of December's Employee Spotlight.